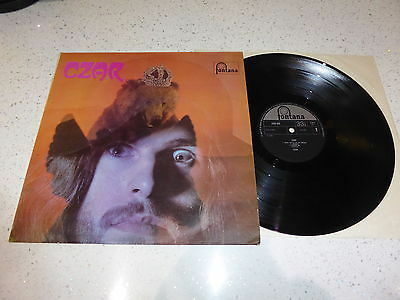 CZAR ORIGINAL UK LP PROG MONSTER FONTANA PENNY START NO RESERVE RARE !!! Original 1970 UK FIRST and EARLIEST PRESSING. LP brilliant stuff all the way with no filler at all. This is seriously rare LP to find. the the bottom left front corner and some edge ware. Other than that its in great condition. The spine is in great shape and all spinal writings can be read clearly . The Fontana record labels are in superb condition both labels have spindle marks. 3 times and this mark amazingly as bad as it looks itmakes noaudible sound whatsoever. at all the either side.If your after a mint copy of this LP then this is not it. through entirely and plays well then this is for you. but it plays a lot better than that. I DO NOT SHIP TO THE RUSSIAN FEDERATION. ITALY or THE UKRAINE. UK is £8.50 first class recorded. GERMANY is £16.50 first class tracked and insured. USA is £26.10 Tracked and recorded. this can change the postage costs dramatically.Items £500 + this can be expensive. For an item valued at £500 it is £59.65 tracked first class with insurance to the USA . For an item valued at £1000 it is £105 tracked global priority to Hong Kong. Please be aware of this while making your bids.